Jill DeWit: And I’m Jill DeWit, broadcasting from beautiful sunny Southern California. 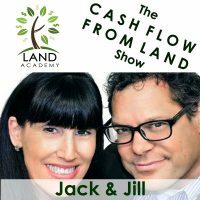 Steven Butala: Today Jill and I talk about Land Academy versus self-starting. Really, just getting some education, where no matter where you get it versus self-starting. It’s land education week here on the podcast. Jill DeWit: Oh, this long. Good point. Doesn’t algebra get old? Steven Butala: When you’re a kid, you’re like, “Oh, he must really be into it.” But then when you get a little older like we are, you realize it is just as painful, maybe more, for the teacher to teach that stuff and talk about it over again as it is for you to sit there and listen to it. That’s not too far off for what’s going on for us here. Jill DeWit: I’ve told the kids, they’re like, “Oh, my gosh, right now, the end of the school year is coming. I can’t wait.” And I tell them, “Your teachers feel that way too. Cut them some slack.” If there’s a movie day, there’s a reason why. They’re sick of you, too. Steven Butala: There’s probably a heroin day for your teacher. Steven Butala: Let’s take a question posted by one of our members on the LandAcademy.com, online community. It’s free. Steven Butala: We use Heartland [00:02:18]. Jill DeWit: And credit cards. Steven Butala: Yeah. In fact, I love where you’re going with the ACH and I understand it, but I prefer to take credit cards for a lot of reasons. And it’s a little bit more expensive. I know. It’s actually a lot more expensive for us, but it turns out we have our property priced so we take that into consideration, so it’s no big deal. And for a lot of reasons, I like it. Jill DeWit: There’s a layer of security with credit cards verus ACH. Steven Butala: I think so, too. Jill DeWit: I’m not a huge fan. I hear people want ACH just because it’s cheap. That’s the only reason, and I’m not a fan for going with the cheapest because the cheapest is not always the best. Steven Butala: That’s for sure. Jill DeWit: Thank you. I had to get that out. Like jewelry, the cheapest is not always the best. Steven Butala: Yeah, and cars and stuff. You’re absolutely right. Jill DeWit: Men, you hear that? Thank you. Steven Butala: You know what this comes down to? Personal preference. Steven Butala: If you go on LandInvestors.com and upper right-hand corner, you’ll see … We have a whole department at Heartland. If you dig down into what Heartland really is there, the providers, one of six providers for credit card processors in the country. Just check them out, and they have accepted and signed off on our product type. Jill DeWit: I have one more thing to say about this too, because, Steve, I think it’ll be beneficial … If you want to do ACH, that’s great. But I would also have a credit card option, because I would argue that you will have more sales if you have a credit card option. Steven Butala: Yeah. You know what, Jill? Jill DeWit: Because not everyone has $10,000 in their bank, but they have money coming in, whatever it is, they want that property so bad they could put it on a credit card, and they could work out the payments themselves with a credit card. So, I think your sales will increase. Steven Butala: We charge a doc prep fee. We call it a doc prep fee on every deal. It’s between 200 and 400 bucks depending on the size of the transaction, which almost always more than covers the price of all this stuff to combine. Jill DeWit: All these fees. Jill DeWit: But I think sales will be higher. Steven Butala: It wasn’t sitting right with me, Jill, and you nailed it. There are people … How many times have we sold big properties on their American Express card? Lots. Steven Butala: And that doesn’t happen with this. Jill DeWit: I personally am not an ACH person. I’m going to use even my debit card because it’s a VISA. Even though it’s all the same thing, everybody, I could write a check or use my debit. I feel a bit better, and I don’t carry checks. And I don’t think about I have to go look at my routing number and all that. I don’t really like that. Jill DeWit: I have to write them a check. Steven Butala: There’s a lot of stuff that’s got to go on. So, I do understand your point. It’s way cheaper, but it’s way harder too. You have enough crap to worry about: running a real estate company than undoing deals. Great question though. Jill DeWit: Yeah, I’m out. Steven Butala: The data piece is just too hard. Or that, or they started with one of the other education providers out there, and they just said this is not taking me where I need to go. Jill DeWit: Right, it’s not big enough. It’s not enough. Steven Butala: When people sign up – we have a lot people signing up – my first question is from where are they coming. Where do they come? Are they just here to hear the show and then they want to try it? Or do they do a bunch of … Here’s my favorite. They did a bunch of research. They maybe bought a list on the internet. They sent a mailer out. They got a huge response, maybe, bought a property. Maybe, bought two. Found out that there’s more to it than this, and that you can actually make some money. And then they came to us and said, “All right. Completely sold on the business model and what’s possible, but now I need to know the details.” Then I know there’s a real good chance they’re going to succeed. Jill DeWit: I agree. I totally agree. So, I was thinking about this and then I started to make a list of the Land Academy, what the benefits are, and versus the self and you don’t have any benefits. Steven Butala: No benefits at all? Jill DeWit: No. What possible benefit? I mean, honestly. Let’s just take a step back. What possible benefit can you think of? Give me one of doing this self-starting, other than your personal satisfaction of it took me five years, but I figured it out myself. Steven Butala: All right. You know what? I feel qualified to answer this because I actually self-started. Jill DeWit: I know, because there was nobody out there to help you. Steven Butala: Right. I’m a self-starter. A lot of people say that, especially in interviews. Oh, I’m a self-starter. No, you’re not. Here’s a profile of a self-starter. I’m going to describe myself. I call the county. I get that actual dataset. I order four pizzas and get two gallons of water at the grocery store, and then I paint the windows black, and I figure it out. I’ll go into a dark room for a week. You’ve seen me do this. Jill DeWit: Yes, I have. It smells [inaudible 00:07:49] too, by the way, when you come out. Steven Butala: And I figure it out. And when it’s done, it’s done. I’ve done websites like this, all that. And I haven’t done anything like this in several years, because in the end it doesn’t make any work. Jill DeWit: Sh, stay away from dad. He’s working on something. Steven Butala: It’s not worth it. But a self-starter, just to prove it to myself. And I can hang my hat on the fact that it cost nothing, probably to my detriment. It’s the same old story. There are certain things you have to make. And that’s data, and I’m a total data person. If you’re not a data person, and you don’t sleep, eat, and breathe excel and creating databases on your own, however you do it in SQL or whatever, there’s no way you could do this. You’d have to learn all that stuff. Actually, now, I’m talking myself out of it. There is no benefit. You’re right. Jill DeWit: Thank you. Give me one. Steven Butala: Unless, you just want to prove it to yourself. But most of us have jobs and stuff. There’s no way you could do it then. Jill DeWit: That’s the whole thing. What you save, gosh, it’s time. I was trying to think of what are the benefits that we provide to everybody in this program. Time savings, check. Money savings, gosh, that’s easy. Less mistakes, check. Steven Butala: It’s not even so much the education, which is, I think, fantastic. It’s the tools like Parcel Fact, and [O-to-O 00:09:15], and all that. Go ahead. Jill DeWit: That’s exactly where I was going with that. So, we got time. We got money. Insight. Gosh, the whole theory, and the concept, and really understanding it and everything. That’s included. How about our online community? How about a group of people that are all doing the same thing with you that you can talk to about these questions every single day. The minute they come up, you have an answer because somebody’s already done it and been there. Steven Butala: Those people are logical buyers, too, of the property you buy. Jill DeWit: It’s our community, cheap data and mail. I mean, come on. Do you really want to go try to … You can’t do that on your own. All this stuff is all because if it’s a group of us, it’s cheaper. And then what you just were covering too, the unique tools that we’ve created just for land people, like Parcel Fact and [Deeperfect 00:10:03] and some other ones. Jill DeWit: Offers to Owners, exactly. It’s just like wow. Steven Butala: I can’t imagine even doing what we do right now without Parcel Facts, specifically. Jill DeWit: Yeah, there’s a few that was a game changer and that was one big one. Man, I tell you. Steven Butala: It used to be that you’d have to go find these properties. Those are hard. Steven Butala: And then, you really don’t know if you did it right. Steven Butala: Parcel Fact’s amazing. Jill DeWit: And that’s what’s so funny, and you’re like and all we have was what we think of where it is, right? We’re staring at it, but you can’t be 100% sure where the boundaries exactly are. And, oh, my goodness. Steven Butala: Yeah, Parcel Fact takes the whole mystery out of it. And then, actually, think about doing a mailing without O-to-O. Jill DeWit: Do you know what’s so cool about Parcel Fact? Steven Butala: I’m going a … Go ahead. Jill DeWit: I have to tell you something really cool. This is something people don’t know. This is silly, but this is how excited I get about it. You’re looking at Parcel Fact, and you’re looking at a property. You scroll all the way down to the bottom. In the bottom-right, you have all the GPS coordinates for every single little point. Steven Butala: Every current point. Jill DeWit: And there might be 20 of them. It’s not just four corners, because you go from here, to here, to here. You literally could go with your cell phone and those coordinates and stand there and stake your own property, if you wanted to, which is so darn cool. Steven Butala: That’s right. People do that. Steven Butala: That’s amazing when you think about that. Jill DeWit: I know. That’s what I’m trying to say. What a game changer. It’s like I don’t even have to … If I really want to, I could go out there with some stakes and a red ribbon and mark out my own property. Steven Butala: And feel good about it. It takes it out. I don’t know. Steven Butala: Like 8 or 10 decimal digits. Jill DeWit: It’s amazing how cool that is. Steven Butala: That’s why we’re doing this education week because we don’t take it for granted, but we just don’t think about how amazing the whole system really is. Jill DeWit: Yeah. We haven’t really shared it. It’s like gosh. Steven Butala: I’m doing a huge mailer right now, almost 40,000 units. You probably don’t even know this, Jill, but I’m really working with O-to-O, which I’m the owner of the company. And I’m realizing how valuable it is. How helpful it is; it really is. Because all I need to do is put the data together and provide the document, and they take it from there. It used to be that it would take me whole weekend to do a mailer. And then if you don’t line it up right, if it’s one line off, you’re sending the wrong offer for the wrong property to the wrong owner. So, it takes all that stuff out of that. Jill DeWit: Well, that can happen. If you have one line off and you send it that way, that could happen. Steven Butala: You could send out 40,000 wrong mailers, which I’ve done. And spent the following two weeks explaining. Jill DeWit: So, you need to make sure your data is good. I have to stand up for O-to-O, Offers to Owners, and just say that you have to make sure your columns don’t … you don’t miss one line and one column, or one little box in one column. I don’t know where you pulled your data. Steven Butala: Self-starting, you can do it, but why? Jill DeWit: Yeah. I don’t have any positive good thing. It’s not you’re not saving money. Steven Butala: No, you’re wasting money. I think that’s the next show. Jill DeWit: You’re not saving time. Steven Butala: It is the real cost of not educating yourself. If you don’t get education upfront … It’s like driving. If you get into a car and teach yourself to drive on the 405, you’re going to get into an accident. And how much is that going to cost? What was the cost education there? You know? Steven Butala: And people and customers and systems and websites and the level of tech that’s involved in all this. For whatever reason, it comes natural to both of us. And for some people, it’s like pulling teeth. And certain parts of it are still like pulling teeth with me. But in general, we make it work. Both with the academy [inaudible 00:14:54] companies and with our actual real estate companies, so that is even a bigger argument for not self-starting. Unless, you have a crazy personality that is … Let’s say Steve Jobs, okay, or Bill Gates or some of the name brand entrepreneurs that are out there who are just hardwired. They’re hardwired to self-start and create brands. Unless you’re one of those people, I’m not sure it makes sense to self-start anything. Go ahead. Steven Butala: Jill just raised her hand like she’s in a classroom. Jill DeWit: I did, that way you know I have something to say. I do think of all of our members, though, as some version of self-starters. They’re just self-starters doing it right, because they really are when you think about it. This is not a franchise. This is just us sharing our business model, and you take it, and you own it, and you do it however works for you. Especially, our most successful members, they are self-starters. They said you know what? I got it now. I took your thing and I tweaked it, and this is my thing, and I’m killing it over here. And this is how I do it, how I work it. So, there’s a version of that. You have to be in the self-starter mindset, by the way, to even find us first of all. Jill DeWit: You’re looking for something. Obviously, you know there’s something out there. You’re not a union person or whatever you want to be. Your 9-to-5 job is not cutting it. You’re looking for something else. Steven Butala: By leaps and bounds, the most successful people that are in our group have already self-started something and realized that there’s more. Maybe, they flipped a house and they did it wrong, and they’re like, “Oh, there’s got to be an easier way.” Or they own a drug store and it’s profitable, but it’s just not getting where they want to be. Or on and on and on. People who sell stuff on the internet, eBay and Amazon and things like that, seem to find us. And I think it’s because what they’re looking for is something that’s more profitable to sell online to roll into their business, like land is crazy, crazy profitable. 100% to 200% profit margins versus consumer electronics, which is 3 to 5 percent probably. And you don’t have to worry about where the next shipment is coming from. 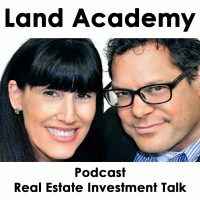 Land Academy is a very logical extension of after you’ve self-started and you realize there’s more. Jill DeWit: Perfect. I could not have said it better. Steven Butala: Well, you did it again. You spent another almost 20 minutes again, listening to the Land Academy show. Join us tomorrow for another interesting episode where we discuss the real costs of not educating yourself first. Jill DeWit: This is going to be fun. And we answer your questions. Post it on our online community found off of LandAcademy.com. Go there, it’s free. Jill DeWit: Yeah. Isn’t that funny. I was trying to think. I started my little list. I put Land Academy on one side and self-starting on the other, and I realized as I’m writing things down on the Land Academy side it’s all positives, and on the self-starting side it’s all negatives. And then I went, okay, wait a minute. Wait a minute. There has to be one positive on the self-start guide. And I can’t find one other than the satisfaction of I figured it out myself, however, how can you be as good as a couple hundred people? And all of our mistakes combined and all of the things that we’ve learned combined. There’s no way. Steven Butala: We never talk about it. Land Investors, itself, the website, which is an online community. People buy [inaudible 00:18:40] property through there. It’s a built-in audience for selling property. Jill DeWit: You’re right. There’s deals. People don’t know that the deals are going on in the background, right on that site. Steven Butala: Right. Read us your list, just read the words, if you’re comfortable doing that. Jill DeWit: My Land Academy site? Okay. On the Land Academy site I put time, money, insight, community, cheap data and mail, unique land tools. Steven Butala: Yeah. It’s not going to be cheaper anywhere else either. I didn’t even say that. Jill DeWit: And on the self side, I stopped with learning curve and mistakes. Oh, yeah, I’m out. I don’t know. I don’t want to make this a negative thing but I don’t know. Hey, share the fun by subscribing on iTunes or wherever you’re listening. And while you’re at, rate us there. We are Steven, Jill.